Today is the first day of Vacation Bible School at Kingsland, the start of one of my favorite weeks of the year. For the past several months, our children’s and preschool ministry staff and volunteers have been hard at work preparing for this intensive week of ministry to kids. For the next several days the walls will vibrate with activity at Kingsland. Kids in attendance will make lots of discoveries about God and His love for them. And they will also learn about how God can use them to change the world. Every year, we challenge the kids who attend our Vacation Bible School to help kids in need in other countries. We believe it’s important to teach our kids that God can use them to change the world for kids who live a world away. Over the past several years our kids have raised funds to help kids who live in Mongolia, India, Cambodia, and Egypt. Last year our kids raised almost $15,000 to build a school for Zabbaleen kids who live south of Cairo. That school is nearing completion. This year, we will teach our kids about the plight of Eritrean kids who have fled dangers in their own country. These children have walked across vast expanses of harsh terrain in order to find a better and safer life in neighboring Ethiopia. Our missions ministry is working with my friend Dr. Jerry Squyres, founder of Innovative Humanitarian Solutions, to build a dormitory for unaccompanied minors in a refugee camp in Endabaguna, Ethiopia. We also hope to hire a teacher(s) to help these children continue their education while they await assignment to a more permanent place to live. This week, every kid who attends VBS will receive a copy of our Summer 2014 Go Beyond Just for Kids magazine. 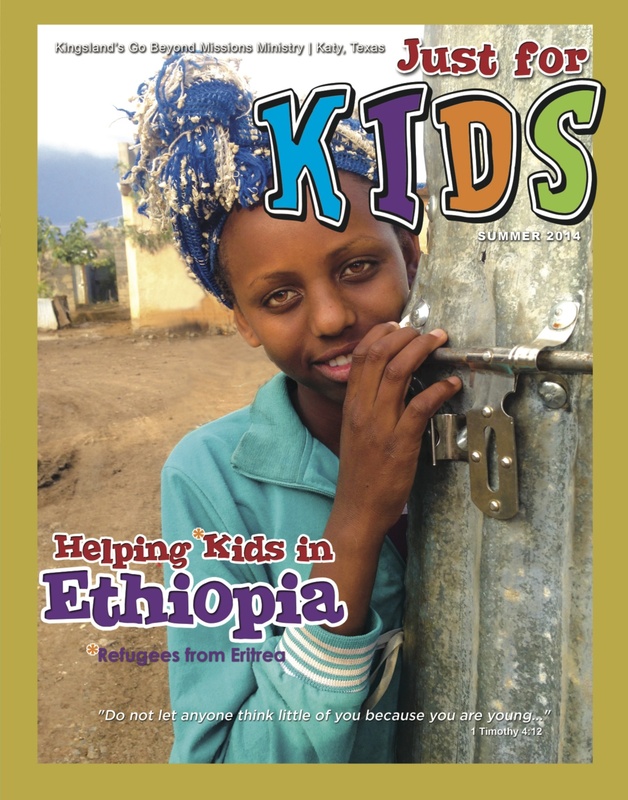 This issue is devoted to teaching our kids about what life is like for the unaccompanied Eritrean refugee minors who live in refugee camps in northern Ethiopia. This issue also features an update and photos of construction of our school for Zabbaleen kids in Egypt. We believe it’s important to teach our kids about the nations and that they do not have to wait until they are grown-ups to make a difference in the world. I look forward to another great week of Vacation Bible School and anticipate that God will once again use our kids to help demonstrate His love to kids who live a world away from our suburban neighborhoods. I am so thankful for all of the ways in which God has used our kids over the years to make a difference in the world. Please pray for the kids who attend VBS this week and also for the Eritrean kids who will be the beneficiaries of their kindness. And when you see one of our kids on or off campus, be sure to encourage them with a word of thanks for all they are doing to love God and love people both at home and abroad.